It’s time to re-connect with whole grains! Grains have had a bad rap since the dawn of the Atkins Diet in the 90’s and the recent Wheat Belly craze. Of course, not all grains are created equally! Whole grains (which contain the bran, the germ and the endosperm) can improve your health in a myriad of ways: they support digestive health, and reduce your risk for cardiovascular disease and diabetes. [i] In honour of Whole Grains Month, we have compiled a list of five nutrient dense whole grains and tips on how to prepare them. Get cooking…for your health! Taste: A light, slightly nutty and subtle peppery flavour. Preparation: Combine 1 cup of amaranth with 2 ½ – 3 cups of water in a pot and bring to a boil. Reduce heat and simmer covered for 20 to 25 minutes or until the grains are fluffy and the water is absorbed. You can add cooked amaranth to soups, stir fries or cookie batter, or sprinkle them on salads. 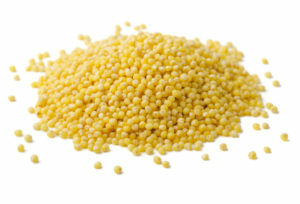 Taste: Millet has a very light, delicate flavour with a touch of sweetness and nuttiness. It tends to take on the flavours of whatever food it is combined with. Preparation: Combine 1 cup of millet with 2 ½ cups of water, bring to a boil and simmer for 15 minutes, then let stand for 10 minutes. This method will produce sticky millet good for pilafs, stews and soups. You can also grind 1 cup of millet and add to 5 cups of boiling water, simmer on low heat for 20 to 30 minutes, and consume as a porridge. Taste: Kamut has a slightly nutty, sweet and almost buttery flavour that pairs well with dried fruits, toasted pecans, vinaigrettes and tahini. Preparation: Add 1 cup of kamut to 3 cups of water, bring to a boil, reduce heat and simmer covered for about an hour, or until grains are tender. Add to pilafs, soups, salads and yogurt. Buckwheat has been providing nourishment for over 8,000 years and this naturally gluten free grain is commonly used in North America to make Kasha (a buckwheat breakfast porridge). Buckwheat is an excellent source of protein and soluble fibre, making it helpful for balancing blood sugar levels. [v] It also contains manganese, iron, zinc to boost the immune system, potassium to maintain acid/water balance in the body, and copper (a deficiency of which can lead to neurodegenerative disorders). Taste: Buckwheat has a robust, slightly bitter flavour that is similar to hoppy beer or darkly toasted bread. Preparation: Add 2 cups of roasted buckwheat to 3 cups of boiling water and ½ tsp of salt. Continue to boil uncovered until the buckwheat has visibly expanded, then lower the heat, place a lid on the pot and cook for another 12 minutes or until the water has been absorbed. Cooked buckwheat pairs well with dark leafy greens, legumes, fried onions and mushrooms. Taste: The taste of quinoa can best be described as a cross between brown rice and oatmeal, with a slightly nutty undertone and a crunchy, yet creamy texture. Preparation: Rinse well to ensure the bitter coating is fully removed. Combine 1 cup of quinoa with 2 cups of water, boil, reduce heat and simmer for 15 minutes. Cooked quinoa pairs well with most Mexican cuisine, can be substituted for pasta with your favourite sauce, can be sprinkled on salads, added to sandwiches, or mixed with fruit and served as a breakfast porridge.